A while back I spent a lot of time trying to understand and then improve a low-cost form of 3D microscopy that had been invented by Prof Tony Wilson and co-workers at Oxford University. The method projects a finely ruled grid onto, or into, the object of interest. The areas of the object that are at the focal plane of the objective show the ruled pattern in sharp focus. To cut a long story short I think that with a few colleagues we did find a way of improving on Tony's method. We had good experimental data but due to rapidly changing jobs and my inability to fully master the Fourier mathematical techniques used in this field I never quite got the paper finished or published. 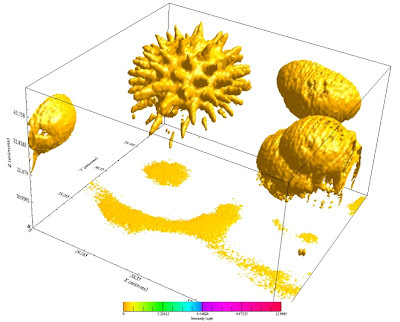 Nevertheless I think the idea has merit - certainly we were able to obtain experimental images with impressive optical sectioning - as an example here is one of the experimental images we took of microscopic pollen grains in 3D.